The theme of this year's AERA meeting is "The Dreams, Possibilities, and Necessity of Public Education." Alumni and friends attending AERA are invited to join the College of Education's faculty and students for an April 14 reception that will take place from 6 to 8 p.m. at the Society of Illustrators. Those planning to attend are asked to RSVP online. To see abstracts from all UW College of Education researchers presenting at AERA, search the online conference program for “University of Washington.” Schedule is subject to change and sessions are Eastern time. In a multi-year design-based research project involving a project-based Advanced Placement Environmental Science course, UW researchers developed design principles for material tools to scaffold disciplinary practice and support formative assessment, while maintaining students’ authority to create arguments. Analysis shows how two versions differently mediated student and teacher activity, and the impacts of those differences on student engagement and learning. Researchers will discuss the resulting design principles and provide illustrative video examples of implementation of the Argument Tool. This study analyzed data for two cohorts of community college students in Washington state using a mixed methods design. Multilevel models showed that college location and focal orientation were the only consistent institutional predictors of student completion: students were more likely to complete a certificate, degree or transfer in an institution with a focus that matched their own, and transfer students were more successful in urban locations compared to workforce students. Case study results revealed that highly effective institutions appear to utilize specific student advising models and have strong, unifying missions. This paper describes how parents design domestic spaces for learning with technology and how children then spend their time working and recreating at home. Analysis positions parents as designers of learning environments and places ethnographic attention on the specificity of their choices related to children’s learning. Interactions between people and mediating artifacts and the material arrangements of technologies serve as the basis for examining learning in home media ecologies. This analysis shows how, while homework is an important site for making home “work” with technology, parents’ design plans are subject to the contingencies of everyday life at home. 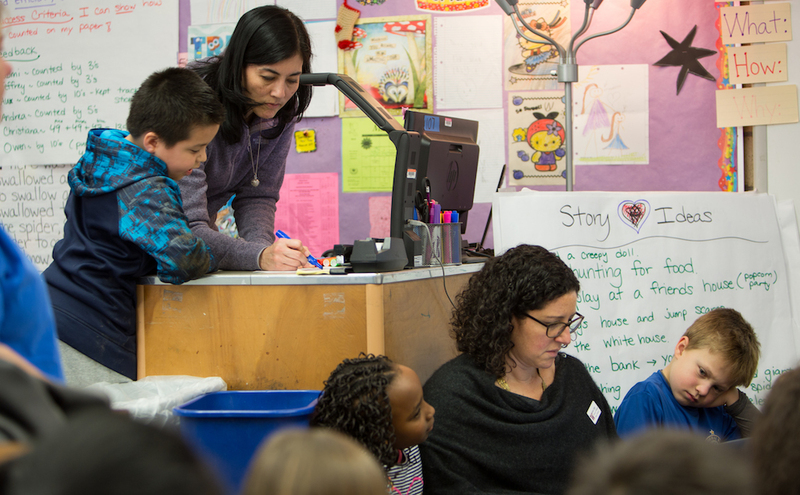 Results from this research-practice partnership at an East Oakland school describe how informal and formal educators gained new perspectives about student learning through dialogue with one another. Afterschool educators created presentations analyzing informal student learning that were shared with in-school staff. The work of afterschool educators became newly visible to in-school staff, and afterschool educators reported an improved sense of pride and inspiration in their work. Differences in learning contexts between afterschool and in-school served as productive tensions through which to surface new ways of thinking about student learning across contexts. Such thinking informed the creation of a learning framework for understanding how learning through making can support STEM learning in school time. Drawing from data collected two years of an Indigenous STEAM camp, this paper explores how 20 youth make relations with the natural world through the historical practice of indigenous observation. Indigenous observation helped the youth understand the ways in which mathematics—the use of patterns and shapes—naturally occur from plant life. Youth were able to 1) build upon their relationships with the natural world, 2) tell stories of their own narratives as relational beings as they deepened their sense of relational reciprocity, and finally 3) imagine their role in creating possible environmental futures for their communities. In this study, researchers explored how an individual with a mathematics learning disability (MLD) who was highly successful in upper division mathematics classes represented, interpreted and solved problems involving fractions. Researchers will present a detailed analysis illustrating how the student had developed sophisticated ways of compensating for her MLD. Findings highlight how despite the student’s success in mathematics, she continued to rely upon characteristic patterns of reasoning identified in students with MLD. This suggests that standard notions about the need to extinguish these kinds of “misconceptions” are not appropriate. Instead, educators need to honor and value the student’s understanding and reframe these patterns of reasoning as differences rather than deficits. This study—which took place during a three-year, teacher-researcher partnership focused on implementation of a Next Generation Science Standards physics unit in an urban kindergarten classroom—highlights elements of a designed learning environment, which were found to support a range of participation styles as students worked to leverage scientific models to learn about complex phenomena, explain their thinking, and become engaged participants in the process and practice of scientific modeling. Researchers present findings that highlight how elements of the design framework afforded emergent bilingual students opportunities to take advantage of a system of supports where they could make intellectual connections between their ideas and scientific concepts. Researchers will share results of a comparative analysis of six superintendents engaged in instructional leadership aimed at fostering equitable teaching and learning for all students. With sociocultural learning theory as conceptual framework, the study found all superintendents described their work similarly but their observed practice differed: Those associated with positive results led for specific shifts in their central office and the principalship from a teaching-and-learning stance, helping their staff learn to improve their leadership even as superintendents were learning the work themselves; others took a directive, hands-off approach. This study investigated how four white, able-bodied pre-service teachers facilitated dialogue about ability and race with young children during shared-book reading, and the experiences that mediated pre-service teachers’ practice. Results demonstrated how pre-service teachers constructed themselves as experts by controlling the amount of child talk and ways children could contribute to talk. When ability and race were discussed, pre-service teachers conveyed the notion that ability and race are neutral identity markers. Given what they gleaned from their early educational experiences, experiences in university coursework, and fieldwork, pre-service teachers had few means by which to enter critical conversations about ability and race with young children. This study examines how film production provides access to new forms of participation in science and engineering (S/E) for teen women from historically marginalized groups. Drawing on critical science agency as a theoretical frame, researchers present findings from an analysis of four youth-produced films that highlight the varied ways urban teen women positioned themselves as authors, leveraged their unique funds of knowledge, and collectively made S/E contributions with implications for action. The study reveals important pivots in how S/E can be accomplished, what it can look like and do, and how S/E can impact women’s participation.